Oh my mother of god, have you seen this one? 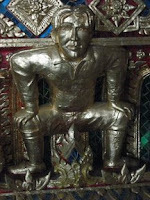 A Buddhist temple in Bangkok has a golden statue of David Beckham built into its altar, can you believe it? Becks is depicted in the style of a garuda holding up the altar itself on his shoulders, the garuda are guardian demons, and a string of them are carved into each side of the altar. The statue itself is definitely Beckham, sporting his floppy haircut from nearly a decade ago and even with the sponsorship logo Sharp picked out on his chest. Im thing wrong..again.